Georg Philipp Telemann's collection of 12 Fantasias for Solo Violin, TWV 40:14–25, was published in Hamburg in 1735. 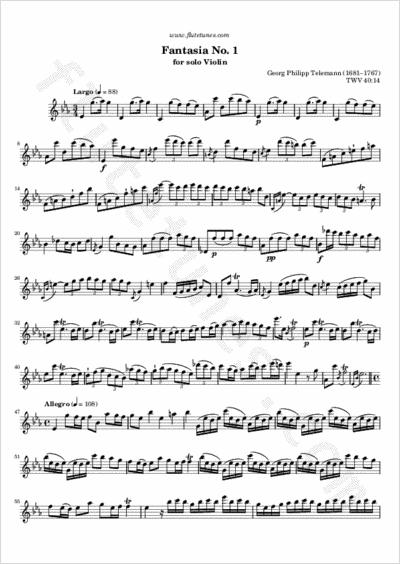 It is one of Telemann's collections of music for unaccompanied instruments, like the twelve fantasias for solo flute. This first fantasia is originally in the key of B-flat major, but we propose it today in the key of E-flat major, which makes it playable on the flute. The original fantasia also includes some polyphony, which had to be simplified. Thanks to Jonnathan for suggesting this piece!